Survivor: Blood vs. Water (2013) - 15th place, 6th out. Voted out in Episode 4, "One Armed Man and Three Moms" (Day 10). 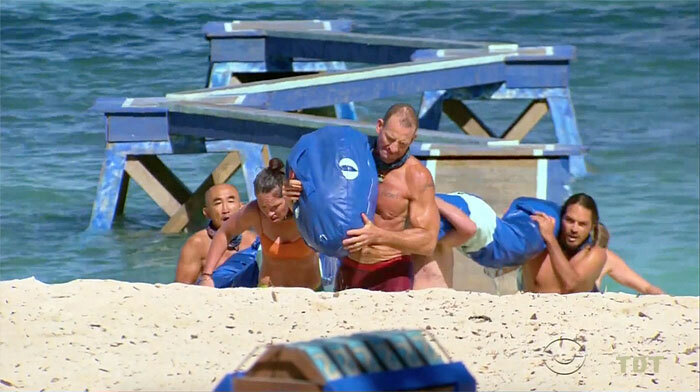 Eliminated in Episode 6, "One-Man Wrecking Ball" (Day 14). 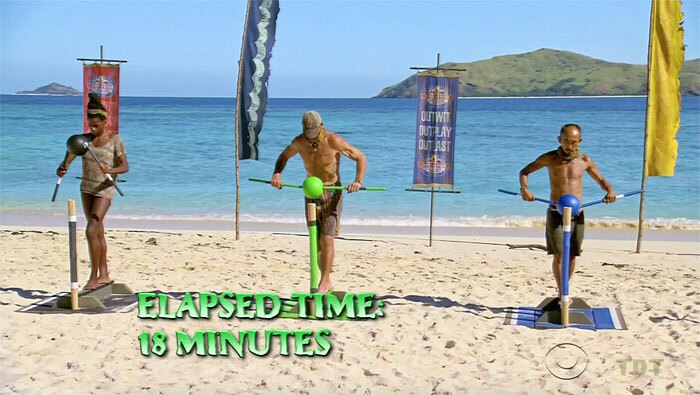 Cumulative longevity totals: In-game - 10.5 days; Redemption Island - 4 days. Survivor: Cambodia - Second Chance (2015) - part of the voting pool, but did not place within the top 10 male candidates for slots. Not to worry! CBS knows better. 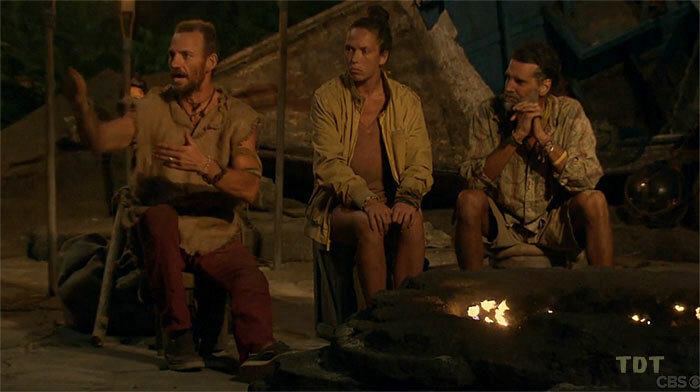 Survivor: Game Changers (2017) - 2nd place, three jury votes. Received three jury votes to finish 2nd (7-3-0) in Episode 14, "No Good Deed Goes Unpunished" (Day 39). Blood vs. Water Ep. 1 RC/IC: "Blue Lagoon Bustle" - Swims and rows for Tadhana, which loses. Blood vs. Water Ep. 2 RC/IC: "In The Barrel" - One of three barrel rollers for Tadhana, which loses again. Blood vs. Water Ep. 3 RC/IC: "Sumo at Sea" - Beats Gervase in his bout, but Tadhana loses once again. Blood vs. Water Ep. 5 duel: "A Game of Bridge" - Narrowly finished second to John, stayed alive (2nd/3). Blood vs. Water Ep. 6 duel: "A Numbers Game" - Finished third, was eliminated (3rd/3). *Note: Finishing second in a three-person, non-elimination duel counts as half a win. Game Changers Ep. 1 RC/IC: "Blue Lagoon Bustle" - Crosses various obstacles, and Nuku wins! Game Changers Ep. 2 RC/IC: "Serpent Turf" - Hauls the giant snake, and Nuku wins again. Game Changers Ep. 3 RC/IC: "Austin's EOC" - Now with New Mana, works the puzzle, but Mana loses (3rd/3). Game Changers Ep. 4 IC: "Ow Pairs" - Caller and plates a ball on the table maze for Mana, but Mana loses. Game Changers Ep. 5 RC: "Unchained Medley" - Waits in vain to work the slide puzzle; Mana loses (3rd/3). Game Changers Ep. 5 IC: "Box Car Blues" - Rolls the cube, hits final three targets, and Mana wins (1st/3). Game Changers Ep. 6 IC: "Cargo Salvage" - Now with Mana (again), hauls stuff, and Mana wins! Game Changers Ep. 7 RC: "Dulcimer Stomp" - Lands two shots with the final catapult, but Mana loses. Game Changers Ep. 7 IC: "Plunge, Pop, Pull" - Dives and retrieves buoys, and eventually, Mana wins. Game Changers Ep. 9 RC: "New School" - With Sarah, unties knots and hauls the net for the losing team. Game Changers Ep. 10 RC: "O Black Water" - Crosses obstacles, retrieves the hook for the winning team. Game Changers Ep. 11 RC: "Angry Chair" - With Zeke & Andrea, works the word puzzle for the winning team. Game Changers Ep. 12 RC: "Full Tilt Boogey" - With Brad & Aubry, crosses obstacles for the winning team. Game Changers, Ep. 8 IC: "Keep on Your Toes" - Ninth person to drop out (5th/13). Game Changers, Ep. 9 IC: "Get a Grip" - Second to drop out, very quickly (11th/12). Game Changers Ep. 10 IC: "Got a Hunch" - One of ten people to not beat Troyzan (tie-2nd/11). Game Changers Ep. 11 IC: "High Step and Stack" - One of nine people to not beat Andrea (tie-2nd/10). Game Changers Ep. 12 IC: "Can't Buoy Me Love" - Outlasts even Tai, and Brad wins immunity! (1st/9). Game Changers Ep. 13 F8 IC: "Teeter Tower" - One of several people to not win (tie-2nd/8). Game Changers Ep. 13 F7 IC: "Vertigo" - Fourth to reach the puzzle stage, but somehow, Brad wins (1st/7). Game Changers Ep. 14 F6 IC: "Maybe I'm A Maze" - First to reach the puzzle stage, Brad wins again (1st/6). Game Changers Ep. 14 F5 IC: "Spoon Man" - Places all three balls, only person to place any; Brad wins (1st/5). Game Changers Ep. 14 F4 IC: "Final Four-titude" - First to start the puzzle, Brad wins again (1st/4). Blood vs. Water, Ep. 3: John shared the second clue details with him, but neither one appeared to look for the idol after this. Blood vs. Water, Ep. 1 (Morning 1): One vote, from Marissa. Blood vs. Water, Ep. 4: Three votes, from Caleb, Ciera and Katie (voted out, 3-3 [3-1]). Game Changers, Ep. 3: Caleb Reynolds (voted out, 5-1). Game Changers, Ep. 4: Malcolm Freberg (idoled out, -5). Game Changers, Ep. 8: Hali Ford (voted out, 7-4-2). Game Changers, Ep. 9: Ozzy Lusth (voted out, 7-4-1-1). Game Changers, Ep. 13 (F8 vote): Andrea Boehlke (voted out, 6-2). Game Changers, Ep. 13 (F7 vote): Michaela Bradshaw (voted out, 4-2-1). Game Changers, Ep. 14 (F5 vote): Aubry Bracco (voted out, 4-1). Game Changers, Ep. 14 (F4 vote): Tai Trang (voted out, 3-1). Game Changers, Ep. 13 (F8 vote): Two votes, from Andrea and Aubry. Game Changers, Ep. 14: Received three votes, from Ozzy Lusth, Debbie Wanner, and Sierra Dawn Thomas, to finish in second place (7-3-0). Oh yeah, we made fire too, guys! Lots of it! Just got the second set of hidden idol clues from John. Heh, I just helped John. How about that? Yup, we got beat. Again. Does this compare to the NFL? Eh, not really. Opening buffs. Tough luck, Debbie. Would Monica sit out the merge feast? Gordon Holmes at XfinityTV.com (9/16/13): "Monica & Brad: 'I Want People to Be Miserable'"
Rob Cesternino at RobHasAPodcast (10/24/13): "Talking with the Latest Player Eliminated from Survivor -- 10/24/13"
Gordon Holmes at XfinityTV.com (10/24/13): "Brad -- 'The Screaming Was Worse Than You Saw on TV'"
Dalton Ross & Jessica Shaw at EW.com (10/24/13): "Brad Culpepper Defends Survivor Strategy"
Gordon Holmes at XfinityTV.com (2/14/17): "Brad Culpepper: 'I've Never Played Real Survivor, I Had to Play with My Loved One, Which Is Totally Different'"
Josh Wigler at Parade.com (3/2/17): "Brad Culpepper Is Playing for Monica"
Dalton Ross at EW.com (5/25/17): "Brad says he 'hated' watching himself on the finale"
Gordon Holmes at XfinityTV.com (5/25/17): "Brad and Troyzan: '(We Did Not Know) That This Jury Was Not Going to Be Bitter'"
Josh Wigler at Parade.com (5/25/17): "The Curious Case of Brad Culpepper's Mustache"
Rob Cesternino at RHAP (5/25/17): "Survivor: Game Changers Winner & Final 6 Exit Interviews"
"Monica may have been eliminated early on Survivor: One World, but she feels her husband (a current attorney and former NFL player) gives her the edge this time around. 'I have to win,' she says, 'and I brought my shield, my armor, my guy to help me get to the point I need to be.' And Brad feels he has an advantage dealing with the elements after surviving the brutality of NFL training camps. 'The hotter the better,' says Brad. 'I'm hoping that it rains every day. I'm hoping it's 100 percent humidity, I'm hoping that it's 100 degrees.'" "Occupation: Attorney and retired NFL player. Played for the Minnesota Vikings, Tampa Bay Buccaneers and Chicago Bears. Personal Claim to Fame: My 21 year marriage. Inspiration in Life: Monica, because she is selfless in her drive to improve our family. Survivor Contestant You Are Most Like: The outdoorsy types like Ozzy, Colby and the first time Skupin played. 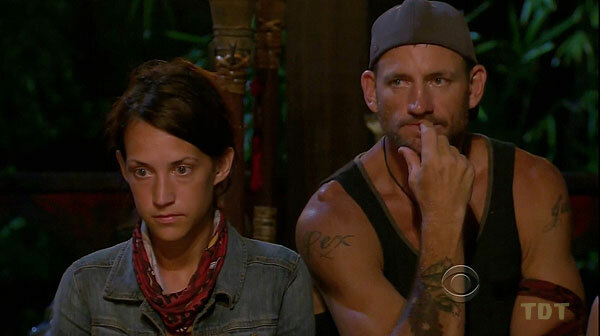 Reason for Being on Survivor: Redeem my wife for being blindsided by Colton. Why You Think You Will Be the Sole Survivor: I grew up in a stilt house on Dog Island in the Gulf of Mexico, spent 18 years in various locker rooms dealing with all kinds, and have devoted my last 12 years as a trial attorney, persuading people to understand my clients’ positions. What Does It Mean to You to Play Survivor with Your Loved One? Monica means more to me than anyone in this world. While this is a once in a lifetime opportunity, I will always place her before me as I would never want to jeopardize her Survivor flame." "How have you changed since the last time you played? I’m a worker. Self-awareness, to a degree. Set up some blindsides that helped [my wife] Monica get to the end."